Photos l to r: Louis M. Bacon; Rotary District Governor Felix Stubbs (right) thanked Louis Bacon’s Moore Bahamas Foundation for the donation of $120,000 toward Rebuild Bahamas, the united Rotary effort with the Bahamas Chamber of Commerce to restore commerce, provide clean water and work toward returning a sense of normalcy in the islands of the southern Bahamas devastated by Hurricane Joaquin. The donation is part of a $250,000 commitment. Two other recipients will be announced later this month. The Bahamas - Louis Bacon’s Moore Bahamas Foundation today announced its donation of $120,000 to the Rotary Clubs of The Bahamas for the rebuilding of the southern islands devastated by Hurricane Joaquin. providing microfinance loans for small businesses. Rotary District Governor Felix Stubbs said the funds would allow them to apply for grants from Rotary International as well. 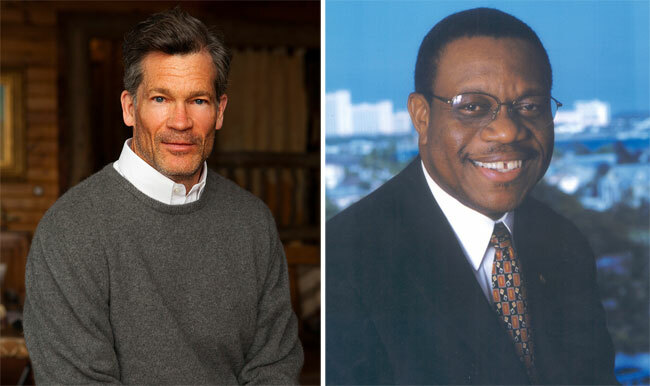 The Moore Bahamas Foundation, the Bahamas affiliate of The Moore Charitable Foundation founded by Louis Bacon in 1992, seeks to promote environmental education in the diverse ecosystems of The Bahamas. The Moore Bahamas Foundation (MBF) supports environmental education to encourage protection of the fragile marine environment that constitutes 90% of the island nation. MBF supports marine education programs that prove successful in building awareness, particularly among students, about the importance of preserving precious marine and land resources. MBF also supports health, conservation and marine research efforts.